Simon Templar, better known as "the Saint," is perhaps the first truly multimedia hero. By the 1960s his adventures had appeared in books, films, comic-strips and on television. But radio has been the most durable medium for the Saint; from the first series during World War II to the most recent in 2002, fifteen actors have played the modern-day Robin Hood. Of course when you mention The Saint on the radio most people think of Vincent Price, and quite understandably for he was the longest-running and most high-profile incumbent of the halo. But who were the other fourteen - and how did they get their haloes? 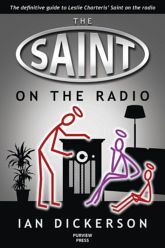 The Saint on the Radio goes behind-the-scenes of the Saint, providing intriguing detail about the series' creation, its writers, episode synopses, all the cast over the years, and two complete radio scripts. It provides an invaluable guide to the radio adventures of one of the 20th Century's most enduring and endearing heroes. Author Ian Dickerson was nine years old when Return of the Saint first aired on television. He's not been the same since. All told his Saintly addiction led to the loss of a large amount of pocket money and many weeks of his life as he spent his formative years tracking down every Saint adventure he could find in a pre-internet world. When The Saint returned to TV in the 1980s he got involved in running The Saint Club, which led to a long running friendship with Leslie Charteris and his family. A thorough examination of The Leslie Charteris Collection at Boston University has led to Ian to write a number of articles on various aspects of the Saint's career. He's also written, produced and directed a number of documentaries on the making of The Saint and Return of the Saint.